Fishing with three hook baits at any distance increases the odds of catching something and it is the chosen method of the match angler or the freelance anglerwho wants continuous rod-tip action. The large scent trail generated by multi-bait rigs grabs the attention of all fish in the vicinity and the tactic is especially popular in February and March when most shore venues are short on big fish and become scratchy for species. Cast accurately and you can get the small fish regularly rattling the rod tip. Three hooks are generally considered the maximum or the most allowed undermatch rules. They are preferred for fishing at close range because on a majority of occasions and venues the small species targeted, especially in the first fewmonths of the year, are found close to shore. Wire booms bring two specific advantages to this hard-fishing situation. The big plus is that lightline hook snoods can be used for a more refined and delicate bait presentation without tangling. The second is that the weight of the booms helps keep the bait close to the sea bed. There is also an opinion that the water’s reaction to metal creates a small electrical field that the fish are aware of, even attracted by, and this has been a theory aboutwhy metal booms sometimes mysteriously outfish all other rigs. The standard mono paternoster is also effective for short-range scratchy match fishing, but if ultra-light snoods are used, they twist and tangle around the body of the rig with 20lb breaking strain about the minimum thatwill not tangle. Using wire booms fitted with a tiny swivel at the end allows longer and lighter snoods to be used, sometime down as low as 5lb. This has an impressive effect on the number of small fish you can catch. It is especially noticeable in catch-and-release events or Continental match fishing, where smaller minimum size limits are employed allowing anglers to target small fish or even mini species. Another advantage of wire booms is that they improve the tangle-free presentation of three hooks close to the sea bed making them especially effective for pier fishing, as well as inshore dinghy sport. ●1 set of Gemini Genie rig. booms. There are enough beads, crimps and springs for three rigs. Available in plain or clippeddown versions. ●3 x 30lb swivels. Use the smallest/strongest available. These are fitted to the eyed end of each boom. ●1 x 60lb swivel for top of the rig. ●1 x Genie lead link. ●1 x Breakaway Impact Lead (or Impact Shield). ●Three size 1 to 4 hooks. ●Power Gum for stop knots. 1. The first step is to fit the small swivels to the end of each of the three wire booms. Cut three lengths of 2mm rig tubing 2-3cm long and slide one on each of the booms. Then open up the eye of the boom with long-nose pliers and fit the swivel. 2. Close the eye carefully and then slide the rig tubing along the boom onto the eye and body of the swivel. 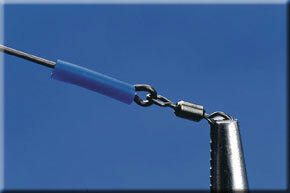 The rig tubing supports the swivel and helps position the hook snood out from the end of the boom. 3. Next, cut the main rig body line at an angle with line clippers, which helps when threading on the components. Then slide on a crimp, SRT spring, bead, boom, another bead and finally a crimp. 4. Repeat for all three booms. Beware when sliding booms on the rig body line that the bait clip wire is positioned towards the top of the rig. When clipped down the clip on the boom is then in position ready for the hook above. 5. Once all the booms are on the rig body, tie on a Genie lead link to the end of the line using a three-turn Grinner knot and measure the rig line to the correct length, which is usually the span of an outstretched arm. 6. Next tie the large swivel to the top of the rig, again using a three-turn Grinner knot. Positioning of the booms is then a matter of spacing them equally over the length of the rig. Close crimps gently, so that they can be moved when snoods are set to fit the bait clips. 7. You can also use Power Gum stop knots on the lower side of each boom to allow for final adjustment. 8. Next tie the hook snoods to the small swivels, add the hooks and hang the rig via the top swivel with an Impact Lead on the lead link. Now you can finally adjust the positions of the booms and tighten crimps. 9. It is very important to tension the SRT springs under each boom because it keeps the boom at right angles to the rig line. 10. This photograph shows how the hook links with the boom clip directly above it.